This 4K spinner sheds hookups to embrace a brave new world, discovers Mark Craven. 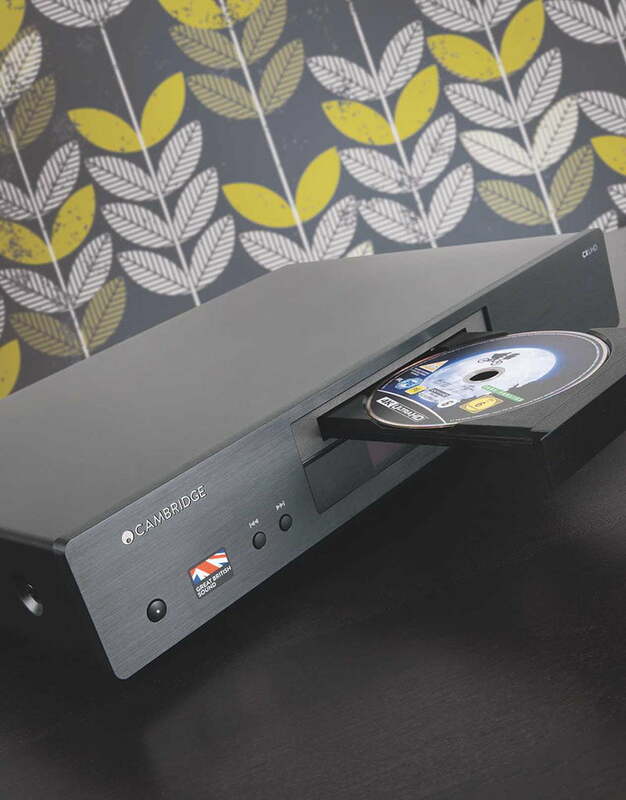 Read our CAMBRIDGE AUDIO CXUHD Review. 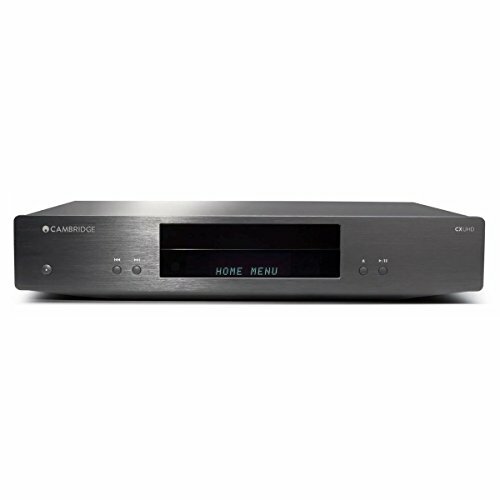 Cambridge Audio hasn’t rushed to release its debut 4K player – the likes of Panasonic and Samsung are already onto second- wave models – but the UK corp has a reputation for premium performance and build, not leading a format charge. Does its CXUHD hit the heights that brand fans will expect? And does it do anything different to the competition? The answer to the latter question is certainly ‘yes’, but perhaps not in the way you’ll have been thinking. 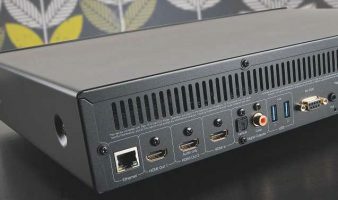 While rival decks launched around this price point, such as Panasonic’s DMP-UB900 and Oppo’s UDP-203, backed up their digital smarts with multichannel analogue audio outputs, there are no such connections on the CXUHD. Heck, there isn’t even a stereo phono output. Those with a passing knowledge of AV gear will realise this means something else – the CXUHD has no onboard DACs (Digital-to-Analogue Convertors). It’s therefore most accurately described as a ‘transport’, able to shunt digital audio (and video, obviously) onto an AVR for decoding. The company’s most recent CD player, the CXC, was also a transport, but it’s previous BD deck, the CXU, wasn’t. So there’s obviously been a change in thinking. On the one hand, the absence of multichannel analogue outputs makes some sense. With HDMI the conduit for 4K HDR video and Atmos/DTS:X bitstreams, most 4K BD buyers will lace to their AVR/processor this way. The lack of a two-channel analogue output, on a universal deck that plays CD, SACD and DVD-Audio platters, is more surprising. Century Fox are causing a stir with HDR10+, but DV has been bolstered by support from Apple, plus actual physical disc content. 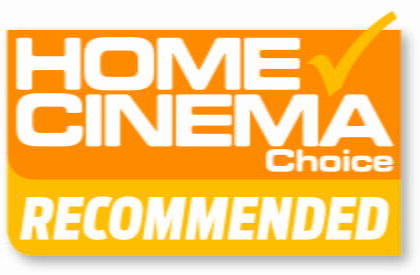 It’s no doubt a good feature to have if you own a compatible TV. The lack of such a screen meant DV went untested in this audition, though. 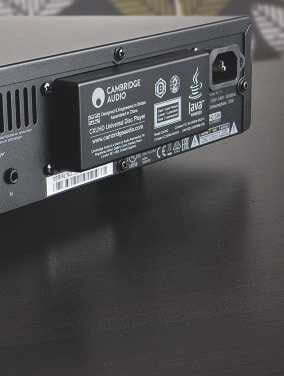 The player features Cambridge Audio’s typical CX design. This means you get a brushed aluminium front plate, discreet buttonry, centralised disc tray and display, and a hefty weight (5kg) that instils confidence. The overall styling is classy, with the deck seeming to float a little off your AV furniture courtesy of recessed feet. It looks grownup and ready for business. Front-facing connections are zero – there’s no quick-stop USB input. Around the back, the absence of phono outputs does leave things a little sparse, but otherwise connectivity is fine. There are two HDMI outputs (one audio only), joined by an HDMI input for connecting an external source (Cambridge Audio suggests a media stick/ player, thus adding video-on-demand tricks to a deck with otherwise no apps). Both coaxial and optical digital audio outs are offered, alongside two USB inputs, RS-232, 12V trigger in/out and Ethernet. Wi-Fi is integrated. The user interface features menus that are crisp and responsive. They share the same basic architecture as Oppo’s decks (that’ll be that MediaTek SoC again) and user options too – this means, when it comes to video output, selectable bit-depth and colour sampling rates, metadata stripping from HDR content, and a custom resolution mode. But with that stripped-back audio connectivity and processing, there’s none of the Oppo’s pre-amp functionality. The remote control is full-length but slim, with a nice tactile back panel. Button layout is a bit unintuitive though (this possibly has the smallest, oddest- placed ‘Play’ key I’ve ever found on a BD remote) and the legends are tiny. There is a backlight function, which is good news. The player loads discs quickly (with identical speeds to an Oppo UDP-203, actually) and, during my audition, didn’t falter or freeze once with any title – BD, CD, SACD or 4K BD. Image quality is bang on the nose. 4K discs exhibit authentic sharpness, wide contrast and rich colouration. Planet Earth II is disgorged as a tapestry of subtle and searing hues, with astonishing detail and silky motion. The CXUHD itself keeps its head down, a quiet operational whirr in no danger of spoiling your enjoyment. A subjective head-to-head with an Oppo UDP-203, with both players in Auto output modes, yielded no difference in image presentation on a 65in 4K display when it came to detail or sense of image depth. That’s not to say that performance is identical; just that I didn’t discern it. I did discover, however, that pressing the rewind key on the Cambridge remote also caused the Oppo’s disc tray to open and shut. Odd. As my colleague John Archer discovers onboard BD deck tweaks can have their use. Brightness, contrast, saturation, hue, sharpness and noise reduction sliders can all be called up from the settings button on the handset, and can have an aggressive impact on image quality. Sensibly, sharpness and noise reduction default to ‘0’ – off, in other words. You can save adjustments to user slots. Note that any changes you make are disabled if the player is switched to Source Direct resolution mode. 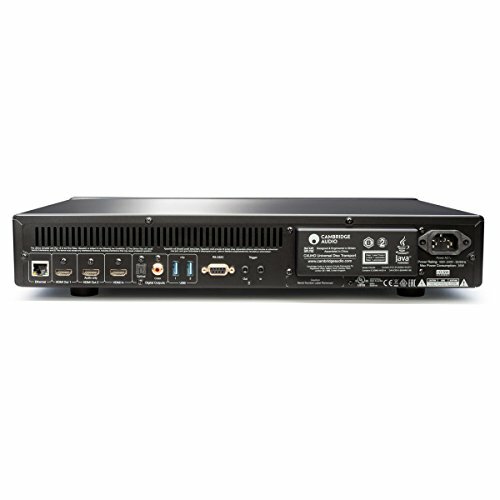 With so much of your system hardware offering 4K upscaling, ascertaining where to introduce it can be a tiresome task. Yet it became apparent (admittedly not from a typical viewing distance) that the CXUHD gave marginally cleaner results over the internal scaling on a Pioneer AVR. Upscaled BDs are blemish-free. Gone from the previous CXU deck is audio upsampling of all inputs to 192kHz/24-bit, but that doesn’t mean this universal player lacks any musical charm. Hi-res (and lossless) tracks, output over HDMI, exhibit precision and clarity. Barb Jungr’s Dylan cover Sara (SACD, Linn Records) carries her vocal inflections and undulating piano accompaniment, to the point where it’s almost hypnotic. Led Zeppelin’s Custard Pie (Physical Graffiti, CD), meanwhile, casts Jimmy Page’s opening riff stage right, before bass and snare take centre stage. As the track progresses, instruments are well separated; when Page’s guitar solo kicks in, the slight reverb is easy to detect. Beyond Cambridge Audio's deliberate omissions, this is a well-featured 4K spinner (Dolby Vision, HDMI input, user tweaks) that looks and sounds great. Not cheap, though. A 2016 4K HDR TV but one due a firmware update for Dolby Vision support before the year is out. If it’s not big enough for you, consider 75in and 100in models.